Sometimes cruddy things happen to super-amazing families. And, sometimes, it feels like the nicest people get dealt the crummiest of cards. I’m not going to say what happened, nor am I going to say to whom. I’m only going to say that a friend of mine, a member of my village, needs some laughter right now. When crappy things happen to good people, you immediately want to do something. Sometimes, there’s nothing that you can do in that moment. Still the friend in you, the mom in you, must do something. What do we all need in our lowest of moments? We need a smile and some laughs, and to know that we have friends who are there to support us. Laughter releases endorphins and takes our mind to a better place, if only for a moment. So, today, I’m sharing with you A Basket of Laughter in hopes that you can share parts of it with someone – in your life – who needs a pick-me-up. 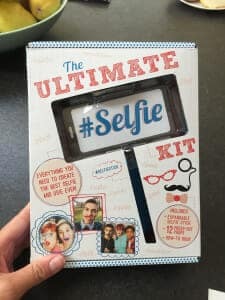 *Disclosure: I received The Ultimate Selfie Kit at no cost in exchange for a post. I only share products that I think others will love and what child doesn’t love goofy selfies? Before creating our basket, my little poppies and I had a brain storming session. We thought long and hard about the funniest things in our home: the books that make us laugh, the toys result in giggles. Then, we popped over to Amazon Prime with our favorites. The results are below. Can’t you just hear the giggles, folks? 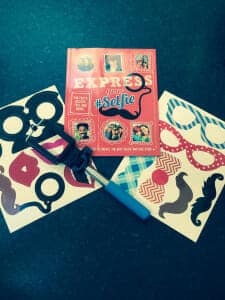 This kit contains an expandable selfie-stick, 12 funny press-out props, and a how-to guide for creating the best selfies! This kit is certain to be a hilarious pick-me-up, or a fun rainy-day activity. Plus, it leaves you with a photo album filled with fun memories! Can you just imagine the possibilities here, folks? Laughter is guaranteed! Yodel – ay – eee – ooo!! This toy is hilarious. We won it in a Yankee Swap years ago and it never fails to make me laugh. If you know me in real life, you are fully aware that I loathe toys that make noise. I make an exception for the yodeling pickle because… well… c’mon! It’s just so random and hilarious! A dear friend of mine gave us a Rainbow Maker several years ago. It is solar-powered and each time the sun hits it, dancing rainbows fill our kitchen. We’ve had it for years and it never fails to make us smile! There’s something magical about a rainbow! Mad Libs rock! They are just as fun now as they were back then, folks! Your kids will giggle away over gruesome words and potty humor… but they will be learning parts of speech as they attempt to gross you out! Win-win! Where you can use potty humor to learn parts of speech! If you follow Leo’s Lounge on our site, you’re well aware that Leo loves a good joke. Here is one of his favorite joke books. We had to include it in our Basket of Laughter. I see the cover and I can hear Leo laughing in my mind! So simple, folks! Simply place all of your laughter items into a basket or tote bag and then drive on over to your friend’s house, ring the door bell, and run away! Yes, I’m telling you to ding-dong-ditch your friend. Why? Because you’ll be providing laughter without intruding and ding-dong-ditches with gifts are fun for all involved. 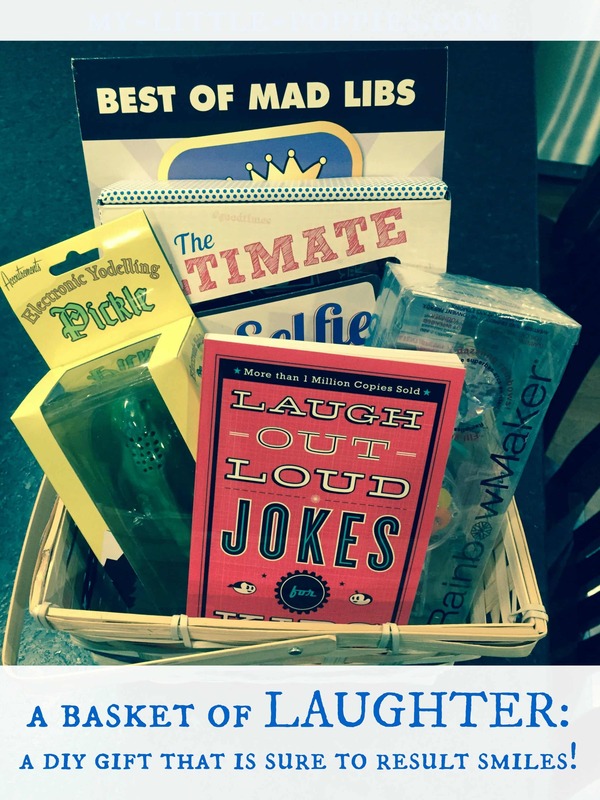 Tell me folks, what would you add to our Basket of Laughter? How have you cheered up a friend lately? Follow Cait Fitz @ My Little Poppies’s board Kid Giggles on Pinterest.